On Tuesday, February 5, 2-3:30 p.m. 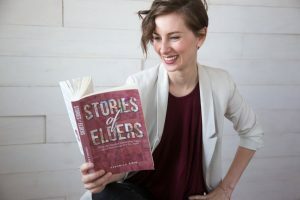 Author and Cultural Anthropologist Veronica Kirin will present her book “Stories of Elders: What the Greatest Generation Knows about Technology That You Don’t.” Kirin published her book in September 2018. The book represents her travels across 12,000 miles of the U.S. to interview 100 of the last living members of the “greatest generation” – all born before 1945. Some of her interviewees are now more than a century old, and their stories include life experiences from major historical events in U.S. history like World War I, the Dust Bowl, the Great Depression, and World War II. They also grew up during the time that modern technologies like airplanes, cars, microwave ovens, telephones, radios, electricity, and the internet came to fruition. You will recognize the names of some of her interviewees – Rhea Currie, Margaret Darger, Ida Mae Harris, Dorothy Hornsby, Yoko Mossner, Virginia Sears, H.J. Smith and Grace Stinton. Many will join Kirin as panelists during the discussion. $5 admission. Her book will be available for purchase and signing. LGBT Chamber of Commerce. She offers entrepreneurial coaching to LGBTQ business owners through her signature Self Care Through Scaling™ program so they work less, grow faster, and earn more. Kirin currently resides in Grand Rapids, Michigan, with her cat Turbo. In summer she can be found in her backyard tending her vegetable garden and relaxing with friends. In winter, she stays as close to a cozy fire as possible.